The BHS Recirculation / Neutralization System (RNS-4-SS) controls, filters, and recirculates water used for cleaning industrial batteries. This process cuts down on disposal fees by greatly reducing the output of contaminated wastewater. When used with a BHS Battery Wash Cabinet, the Recirculation / Neutralization System creates a closed loop. This eliminates the need for floor drains and water supply as you use the same volume of water for multiple washes. Washing electrolyte from batteries is a safe and contained process when you use BHS equipment. The RNS-4-SS comes standard with a 200-gallon tank, a spray wand with 10-foot hose, and a 12-volt dc sump pump with float switch. An in-line pH monitoring system aids in keeping proper pH level. The Recirculation / Neutralization System features an on-demand, automatic start system. An auto-shutoff for unsafe pH range, filter service, or low water level makes maintaining the system simple and easy. This ecologically friendly system also boasts a built-in ozone purification system. The RNS-4-SS contains the fewest number of components in the industry to lower operating costs. The rotary gear pump has stainless steel internal parts to extend component life and reduce maintenance needs. A removable front panel allows convenient access when maintenance is required. Make washing batteries cheaper, easier, and greener with BHS products. 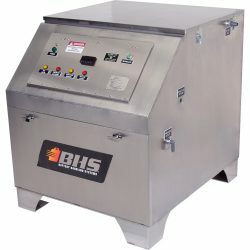 Call us at 1.800.BHS.9500 to learn more about the Recirculation / Neutralization System or other Battery Wash Equipment. Note: 120 volts / 1 phase / 60 hertz only. Contact Factory for other voltages and frequencies.